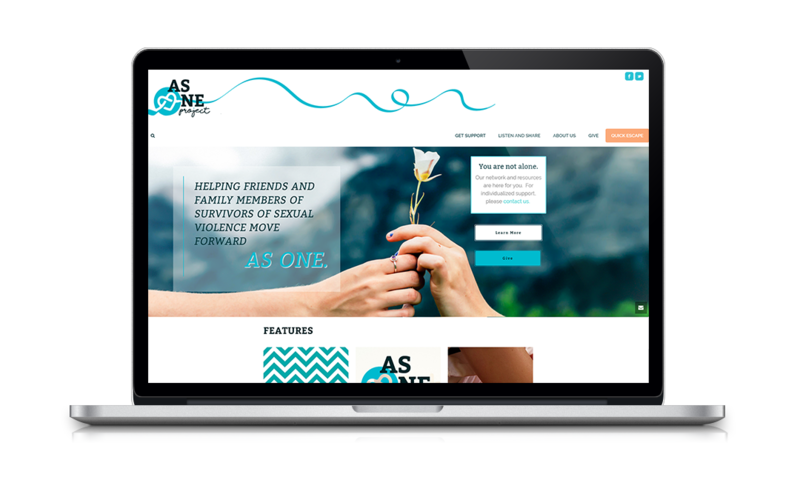 The As One Project provides resources and a supportive community to secondary survivors of sexual violence — but their website was unwelcoming and confusing for users to navigate. We helped them create a comforting atmosphere on their site, reorganized so users could find the information they needed as quickly as possible. As One Project’s biggest goal has always been to serve as a place of comfort and information for secondary survivors of sexual violence. Offline, they are making huge strides in building a warm and welcoming community but online – with a muted color palette and confusing information architecture – the original website felt cold and disorienting. The website lacked a community aspect where visitors could share and engage with each other for support. Many of the links were broken and the donate button linked to a PayPal page that was unable to accept payments. Their logo – while informative – was illegible with too many cramped words. The front page lacked a mission or a major call-to-action, telling the visitor where to get started. Their front page had many redundancies with the blog in multiple places above the fold and social media overload. Many pages were unfinished or in major need of a rewrite. Here’s our analysis of their old homepage and what we needed to fix. When redesigning their website, our main mission was to create a comforting aesthetic and to reorganize the entire site so that those who need information can get to it as quickly as possible. We added a “share your story” section to the site, which allows users to share their experiences being a secondary survivor. Made the site more uplifting through a fresh color palette and logo redesign – mirroring the ribbon used for Sexual Assault Awareness Month. With pictures reflecting the diverse community they serve, we reinforced the fact that sexual violence affects everyone. We simplified the main navigation in the header, but added a mega menu that allows As One to present their catalog of resources in an organized manner as a dropdown. 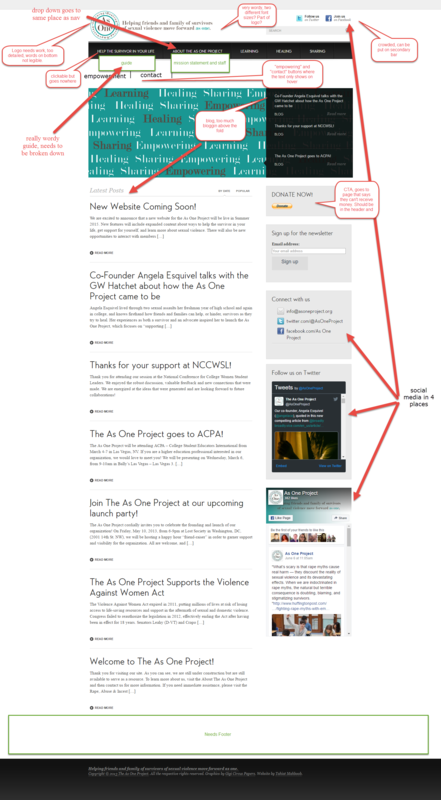 We redesigned the front page to put a major emphasis on the mission of the project and their impact. Rewrote and formatted articles in a way that made them more digestible. Fully integrated Neon CRM which allowed us to fix their donation issues. We added an “emergency escape” button for users to protect their privacy in an instant. The overall site is considerably more uplifting. The new functionality of the site allows users to quickly navigate information to help support their situation, as well as a place to share their own experiences. By moving the website to WordPress, As One Project can quickly and easily update their resources and facilitate the community forum of stories. By integrating Neon CRM with their site, As One has saved time through automation and can focus more on the important work they do!